Waste Management hauls out their Dream Cruise garbage truck every year, often filling the back-end with Chinese-made trinkets to throw to the kiddies. Garbage, in other words. The pristine truck is always a crowd-pleaser, though, and no doubt engenders goodwill toward an industry better known for mob ties and landfills. 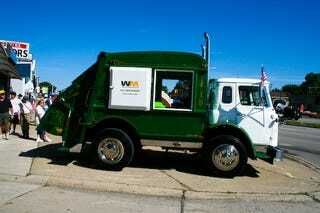 Enjoy the full WMI Green Machine gallery below. Follow the fun at our Woodward Dream Cruise tag for all of our coverage of the 2008 Woodward Dream Cruise, the largest one-day automotive event in the world!